Well, maybe someone does, but mostly they write about the bus map’s more outgoing sibling, the London tube map. People make alternative tube maps, they map emotions, housing prices and literature to the design of the London tube map. The bus map stands alone. I’ve not seen one parody of it. Londoners don’t look fondly on their buses, but I think they are a good deal. I’m staying in South London, and there are only a couple of tube lines down here. So most of us south Londoners bus it around. Just a few weeks ago, London started the Hopper Fare, where you have an hour to transfer to a second bus for no extra charge (2 rides for the price of 1-just like in NYC). It’s a lot cheaper than the tube and depending on your journey and the time of day, it may not be slower than the tube. No driver on the top. As in New York, the bus gives you an opportunity to see the sights. In London you get the added bonus of seeing it all from the top deck. You can watch the cyclists seem to disappear as the bus rolls right up to their back wheel. At times when you in the front seat on top, when turning sharp corners, you feel like you are on a fun house ride, whipping this way and that as you think for sure you are going to hit that pole that you are hurdling toward. 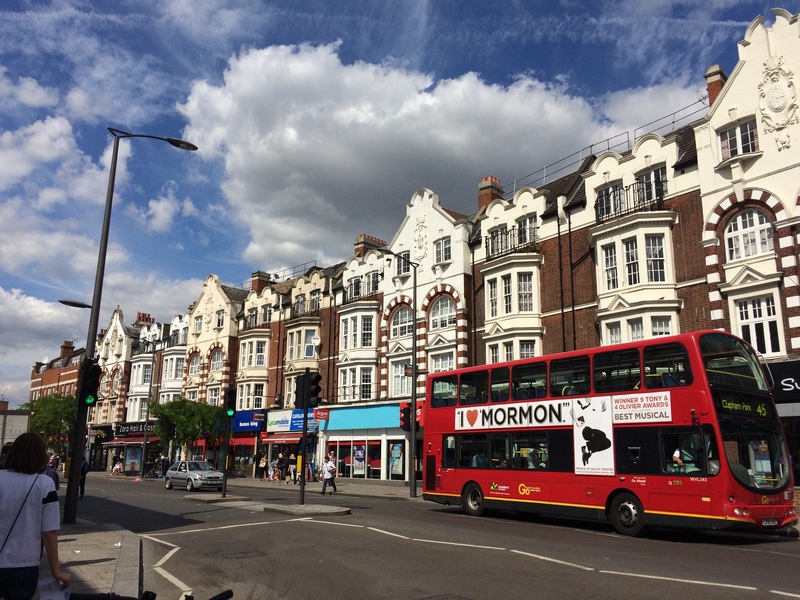 Buses can get you where the tube can’t. The system is so extensive, it has to be delivered on several maps. The TfL has a great, easy to use map and wayfinding system to help you figure it out. 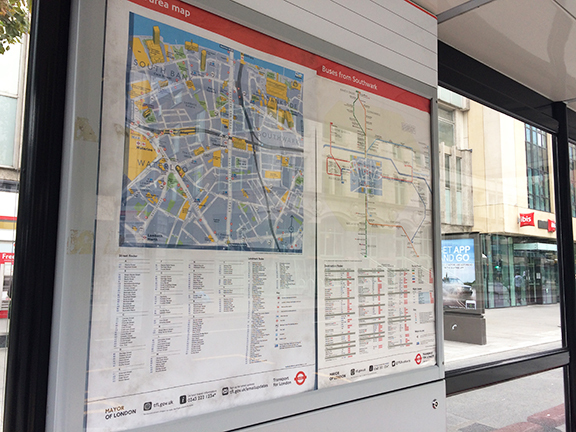 Most bus shelters and stops have an extensive map that shows all the lines from that stop. The map will have a blow up of the area that includes several stops on nearby streets. Each stop is keyed with a unique letter on the map and on a pole at the actual stop. 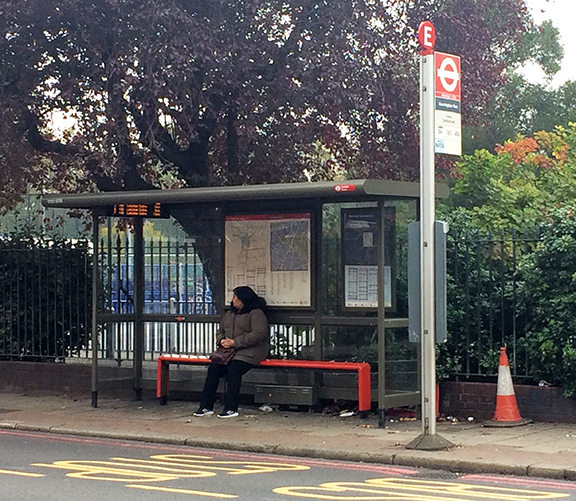 A typical London bus stop and shelter. This is bus stop “E”. 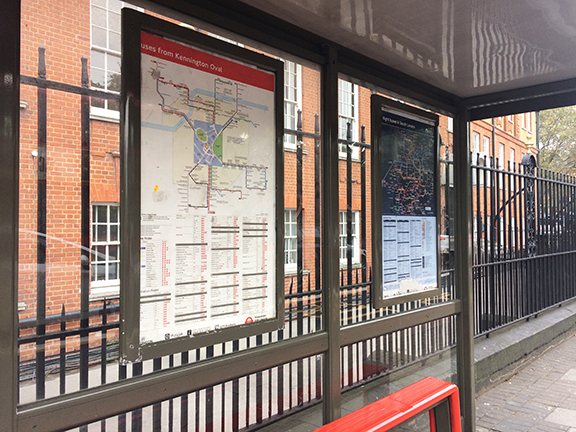 Bus shelters in high traffic areas will have a Legible London map as well. The darker map on the right is the “night bus” map. The night bus does have it’s own television show, named, appropriately “The Night Bus” on channel 4. It’s very easy to know if you are at the right stop and you don’t have to worry if you are on the correct side of the street. There’s a cross reference listing all the destinations as well. Just find your destination and its corresponding bus stop letter and you are ready to go. If you want to see the Tower of London, wait at stop SA or SD stop for bus 100. No need to follow the bus route line on the map to see if that’s where you’ll be headed. When you are on the bus, you can keep track of stops by watching the readout. Each stop is announced, which is very handy if you don’t know where you are! Consider the bus. You might need a little more time, but you’ll enjoy the ride!